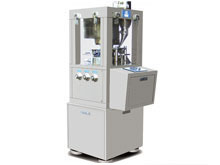 The ZPS8 rotary tablet press is a small intelligent machine that is applicable for making tablets of small batch in drug research and development center in pharmaceuticals industry, laboratory, etc. 1.Based on the initial prototype design of original machine, we get this rotary tablet press reinforced on the structure of main transmission box. Therefore, this product becomes more powerful, stable and durable. 2. Forced feeder is optional adapting to demands of users. 3. If the 3/4"BB dies are adopted, the rotating turret can carry 20 dies. The maximum diameter of finished tablet reaches 13mm and the maximum production capacity is 36000pcs per hour. Other main parameters are kept same. 1. This single-press machine gets the tablets ejected with single side. IPT compliant dies are utilized to process granular materials into circular tablets and other irregularly shaped pills in different specifications. 2. Quality of the tablet is enhanced greatly through precompression and major compression. 3. To be configured with continuously variable speed regulator is helpful for operating the machine in a convenient, safe and reliable way. 4. The rotary tablet press is outfitted with PLC programming unit with touch screen. It is capable of presenting various parameters and data, such as rotating speed of turret, instant pressure of every working dies, ejection force, product name, batch number, production time, impeller speed of forced feeder, etc. Situations of faults will be showed and recorded, such as emergency stop, motor overload, system overpressure, etc. Meanwhile, the machine supports parameters setting function, like the pressure of system, average pressure of working dies, fill depth, thickness of tablet during precompression and main compression, production capacity and so on. Through USB port, USB flash disc can be connected to collect and read the real-time working data every ten minutes for printing. 5. Overload protecting unit for the motor forces the machine to stop automatically in the situation of overload. In addition, this product is also equipped with a series of safety devices, such as overpressure protector, emergency stop unit, powerful ventilating and heat dissipating equipment, etc. 6. To avoid contamination, our rotary tablet press selects enclosed stainless steel housing and all parts possibly contacting with medicine are made of stainless steel or processed with special surface treatment. 7. Structured by four sides of transparent organic glass, the pressing chamber can be opened thoroughly so that it is very easy for internal cleaning and maintenance. The ZPS8 rotary tablet press machine is a single-press machine with maximum production capacity of 14,400pcs/h, suitable for making tablets of small batch. FEIYUN, as a reliable pharmaceutical equipment manufacturer, provides a wide range of pharmaceutical machines that meets cGMP standards, which include medicine pack blister packaging machine, capsule filling machine, tablet coating machine, medical high purity nitrogen generator, etc. If you are looking for pharmaceutical machinery with specific functions, please send us message and we will recommend the right models for you.